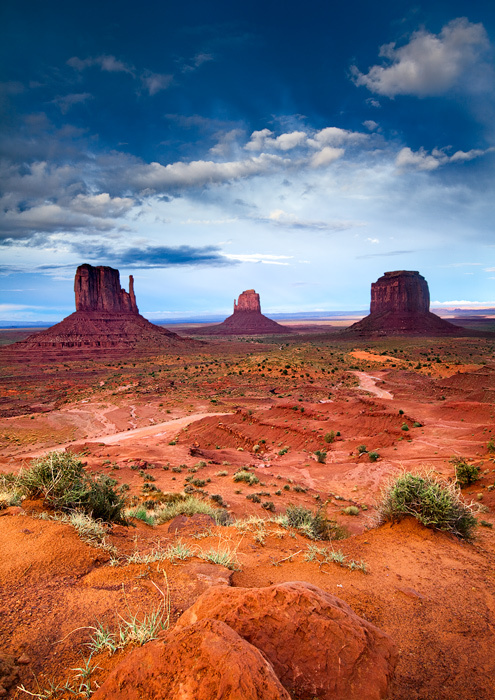 The Mittens are certainly one of the most recognizable and iconic views in the United States. PIctured here after three days of rare torrential rains (in May), the clouds slowly began to clear for this view, taken about an hour before sunset. The heavy rains saturated the pastel colors of the sand and are complimented by some of Arizona's grandest skies. A road leading through the park intersects the middle of this scene. Photo © copyright by Michael Greene.